Our approach to promoting good behaviour is underpinned by our Christian values. As a Catholic school community, with Christ at its heart, we try to show love, friendship, respect, understanding and forgiveness. We want all members of our school to feel valued, special and a sense of belonging. Positive relationships and good behaviour enable children to feel happy and safe at school and this supports children in being receptive to teaching and learning. Good behaviour in school also allows teaching and learning to progress, free from disruption. 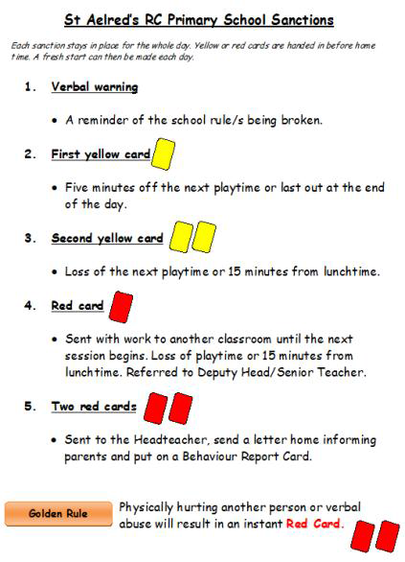 Our behaviour policy is therefore designed to support ways on which all members of the school can live and work together cooperatively and supportively. Emphasis is placed upon recognising, congratulating and rewarding good behaviour and taking time to help children to see the negative impact of unacceptable behaviour - helping them to mend relationships and make amends. Children throughout the school are given a crystal - our Pebbles of Perfection! - when they show kind and thoughtful behaviour and good behaviour for learning. 'Pebbles' are collected by each of the four houses: Emerald, Sapphire, Diamond and Emerald. The house that receives the most each half term, receives a reward. In addition, classes have varied ways of encouraging kind behaviour and good behaviour for learning skills and attitudes. For example, Year 6 pupils self-evaluate their attitudes, organisational skills and learning behaviours as they get Year 7 ready. Classes have class contracts where pupils agree their class rules and routines to ensure classes have good learning environments and positive relationships. Suspension/Exclusion is a last resort for persistent serious breaches but may be used in extreme cases (eg of violence, of other anti-social behaviour).